Vizagites have a love affair with plastic. 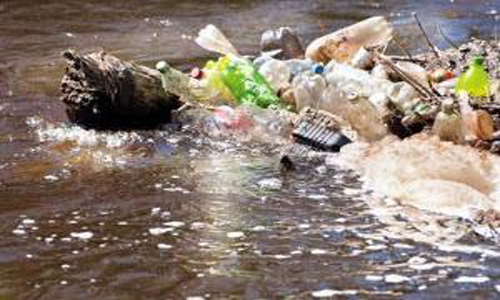 Look around and see the ubiquitous water bottles, water sachets, milk sachets, plastic bags, tea cups, and Styrofoam plates. There are plastic mounds everywhere, from Akkayapalem to Andhra University, from Dabagardens to Dwarakanagar, from RK Beach to Railway Station and Gajuwaka to Gopalapatnam. They lie in heaps — at the tiffin, tea and pani puri shops, stuffed into Vizag’s drains and geddas, strewn across our once pristine beaches, at RTC bus stands, alongside our roads and rail tracks, on every empty plot of land and at temples where prasadam and offerings made are accompanied by some sort of plastic. Plastics are a headache to get rid of. They are not soluble in water and just do not decompose or deteriorate easily. So every time we throw away plastic it just does not “go away”. It remains in the environment for hundreds of years. The banana peel or leaf you throw away will decompose in a week or two but the Rs 15 water bottle you chuck into your backyard will lie there for 450 years!